Yes, Virginia, it's not fun and sun here in Arizona. 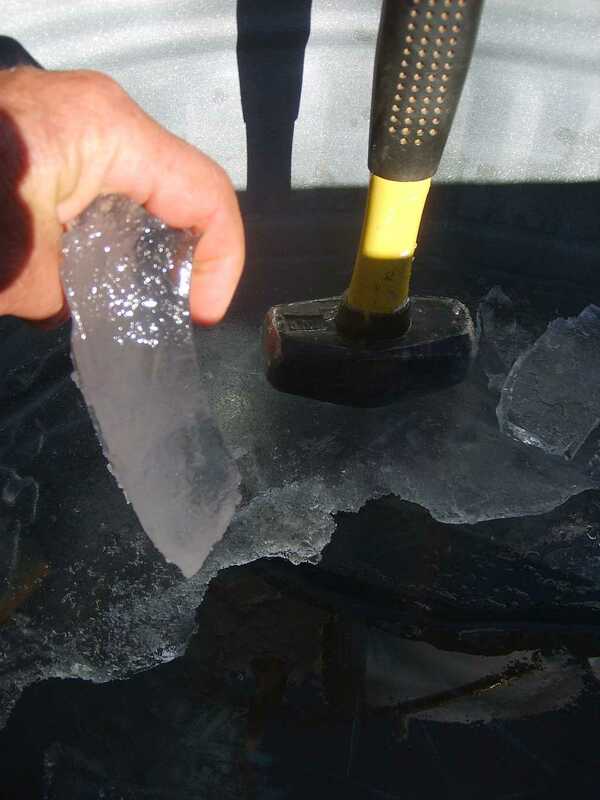 Sometimes, we have to break the ice with a small sledge hammer! It's 3 degrees outside as we write this. Luckily, that's +3. Since we first moved here in February 1993, the lowest we've ever recorded has been +4 sometime back in an El Nino Winter during the 1990's. Hey, it's cold all over our country and, as we've already said, we're not complaining. It's just worth noting that this is quite cold for our neck of the woods. Speaking of cold, the Flagstaff NWS put out a little ditty overnight detailing how cold it was in Flagstaff and Prescott yesterday. Interestingly, the weather wonks discussed how cold the daily HIGH temperature was. We think you will find this page very interesting. Click here to check it out. Susun sends out a very grateful and happy THANK YOU to everyone who left a blog comment, called, dropped by or sent an email or e-greeting. We don't think she's ever had as many birthday wishes from far and wide as she had this year. We both got a chuckle out of Goatherder's note that they are going to demand to see her driver's license for proof of age. Roger. PS--You will note that the Lake Montezuma NWS data site shows a low of +9 or thereabouts. We live in what's called a "cold sink" beside Beaver Creek. It's always several degrees colder on nights like these because of the way really cold air sinks to the lowest topographical spot, typically alongside streambanks.